There is still a plan for the cure – which involves getting Christine’s DNA. Jim is awkward and reluctant because he’s Jim. Convincing him does give Hector chance to give us more flashbacks of the ranting Patrick who screams about the queen being born, eggs, and a “war to come.” Lily is Patrick’s daughter. Julia arrives while Jim is being suspicious and she decides she also doesn’t want resources, science and armed men on their side which shouldn’t surprise anyone since it’s Julia. Hector warns them that infection is forever and emotional whammy doesn’t cure anyone – it only makes Kinshipness go dormant: basically Jim, Julia and, maybe, Joe are the only non-infected ones. Julia decides that just because it happened with the last 2 eggs doesn’t mean it will happen with this one so they totally shouldn’t go for Hector’s cure. Seriously, not enough booze in the world. 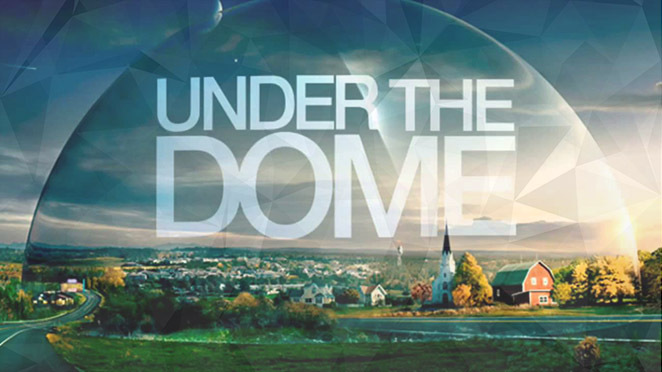 To the Kinship and Junior and Sam have Joe imprisoned to try and get him to bring down the Dome with violence. Barbie goes looking for Christine and instead finds Junior who tells him about Christine & Eva at the barn of weirdness and how they have Joe and need him to bring down the Dome (it has to be Joe because…). Junior is kind of frustrated that torturing Joe isn’t working. Still he’s convinced in 5 seconds and, after sharing the Dome is calcifying, he decides he has to stay and build the device to help the kinship or they’ll all suffocate. It’s a good thing Barbie isn’t mind controlled because if this were a ploy it would have worked oh-so-easily. So Joe decides to stay and Barbie and Junior have a power struggle with Barbie trying to make Junior accept Barbie is above him and Junior trying to poke Barbie’s emotions because Junior is suspicious. He takes his minions to go looking where Barbie claimed he buried Julia’s body – he’s now convinced that Barbie is anti-kinship. Julia and Barbie meet up to discuss their various fun activities and Barbie decides rather than take the cure he needs to go rescue Eva from the creepy barn for the sake of the evil baby! This is the worst idea. Julia decides she respect his decision to go save his evil baby alien and risk being controlled by the mind controlling kinship. Let me be clear that I totally do NOT respect this decision. This seems to be confirmed when the cultist, Charlotte’s, limp body is carried out as Barbie barges in. Eva has skipped forward several months in the pregnancy. Eva’s all gleeful about this and Barbie keeps playing along. And Julia who has been following Barbie, finds a pit full of sacrificed cultists. She’s also caught by one of the watchers and tries reason because she’s Julia. Norrie decides to shoot the woman in the head. This is more effective. Also, Hunter manages to crack another secret file in the pile of secret files – and finds that Patrick (Lily’s dad) is still alive. Am I supposed to care? And Hector apparently wants to keep the Dome up forever to keep Lily safe from something? He even planned to blow up the red door when he left so no-one else would ever be able to follow. He told this to Patrick who seems oddly… lucid, when he’s not turning into a ball of energy. I think the Resistance is karmic punishment for Big Jim. For all the evil stuff he’s done, he is now condemned to ally with these people. I think I know why Sam joined the collective – he looked at the Resistance and realised becoming a brainwashed drone was actually the best option. Julia gives me all the grey hairs in the world. Is there a reason why no-one, not one single person, has considered the consequences of unleashing the pod people on the world? Also I think Hector has a very limited chance of survival.